Reliance has plans of developing an ecosystem of digital infrastructure, telecom and IT start ups in Amaravati. 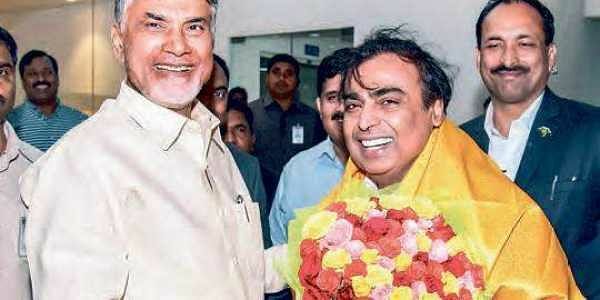 VIJAYAWADA: Reliance Industries chairman and managing director Mukesh Ambani who called on Chief Minister N Chandrababu Naidu at the Interim Government Complex (IGC) in Velagapudi on Tuesday expressed willingness to set up an electronic park in an area of 150 acres at Tirupati and build a mobile manufacturing unit having the capacity to produce 10 lakh mobile phones per month. During the meeting, Mukesh indicated that Reliance would train students at the electronic park and announced that citizen service centres would be installed in 5,000 villages to extend government services to the people at a minimal cost.The business magnate said a solar plant and data centre spreading across 150 acres in Peddapuram was also on the cards. Reliance has plans of developing an ecosystem of digital infrastructure, telecom and IT start ups in Amaravati. Ambani is understood to have promised Naidu of support to develop the new capital into a smart city. The Reliance chief who landed at Gannavaram earlier in the day was welcomed by IT Minister Nara Lokesh. The two then took a chopper to the IGC, where Ambani met the Chief Minister and discussed topics ranging from agriculture to administration. Ambani who praised Naidu’s Real Time Governance Centre had dinner at his residence.